A contemporary, fruit-driven style of Rioja that is very popular, and for good reason. It's the smooth, velvety texture of this wine that makes it such a pleasure to drink. Showing the Rioja hallmarks of attractive sweet cherry aromas and strawberry notes on the palate with a hint of warm spices. Great with roast lamb. Wine of Spain. Award-winning Rioja, perfect for dinner parties as well as for everyday. 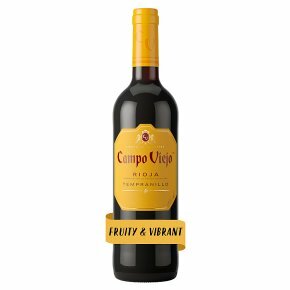 This rich and fruity wine from Rioja is perfect with pasta, poultry and fresh light cheeses, grilled chicken, small bites (light cheese, grilled vegetables). The 2013 vintage won a Bronze Medal at the International Wine & Spirit Competition 2015 and at the Decanter World Wine Awards in 2015.